Youngstown - Ethel J. Macek, 94, died Friday, November 30, 2018 at her home. Ethel was born March 11, 1924 in Youngstown, a daughter of Matthew and Mary Kozak Holecko. A lifelong Youngstown resident, she was a 1942 graduate of Woodrow Wilson High School and was a dedicated homemaker. She was a longtime member of Our Lady of Sorrows Parish at St. Matthias Catholic Church inYoungstown, the First Catholic Slovak, and the Slovak Catholic Sokol. Ethel enjoyed golfing in her younger years and more recently enjoyed shopping, casino trips, and playing bingo. 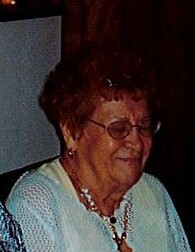 Her husband, Thomas V. Macek, whom she married June 9, 1956, preceded her in death on October 9, 2003. She is survived by her son, Thomas D. Macek of Austintown; and numerous nieces and nephews. In addition to her parents and husband, Ethel was preceded in death by six brothers, John, Frank, Tom, Richy, Leonard, and Edward and seven sisters, Mary, Annie, Agnes, Margaret, Helen, Geraldine, and Mildred. Per Ethel's wishes, there will be no calling hours or services. A private committal service will be held for the family at St. John the Baptist Catholic Cemetery. Arrangements are being handled by the Cunningham-Becker Funeral Home, Poland Chapel. Please visit www.beckerobits.com to send condolences.